Map of the United States showing State and international boundaries. Two colors are used to differeniate between Union and Confederate states. Two years and one month later, Nicolay sent a note to President Lincoln at the White House: “Constitutional amendment just passed by 119 for to 56 votes against.”2 Nicolay was on Capitol Hill to witness passage of the Thirteenth Amendment to the Constitution which outlawed slavery anywhere in the United States – not just in those areas engaged in the Confederate rebellion. Ronald C. White Jr. wrote in Lincoln’s Greatest Speech wrote: “Lincoln’s challenge as president was how to balance his opposition to slavery and his fidelity to the Constitution. He was aware that there was a certain truth in [William Lloyd] Garrison’s charge that the Constitution was a compromise document that allowed slavery in the South. Lincoln had, however, argued at Cooper Union in 1860 that the founders were united in opposing the spread of slavery to the new territories. 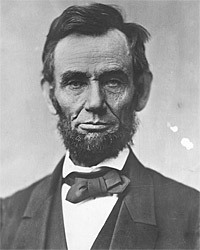 He came to believe that the founders believed or hoped that slavery would one day become extinct.”5So did Mr. Lincoln. Mr. Lincoln’s thinking on freedom and slavery evolved during the war. Even as he was drafting the emancipation proclamation in the summer of 1862, he was trying out other ideas. Illinois Senator Orville Browning wrote in his diary on July 1, 1862. “Immediately after breakfast went to the Presidents with Uri Manly. Saw the President alone, and had a talk with him in regard to the Confiscation bills before us. He read me a paper embodying his views of the objects of war, and the proper mode of conducting it in its relations to slavery. This, he told me, had sketched hastily with the intention of laying it before the Cabinet. His views coincided entirely with my own. No negroes necessarily taken and escaping during the war are ever to be returned to slavery – No inducement are to be held out to them to come into our lines for they come now faster than we can provide for them and are becoming an embarrassment to the government. “At present none are to be armed. It would produce dangerous & fatal dissatisfaction in our army, and do more injury than good. The proclamation was, as you state, very near to my heart. I thought about it and studied it in all its phases long before I began to put it on paper. I expected many soldiers would desert when the proclamation was issued, and I expected many who care nothing for the colored man would seize upon the proclamation as an excuse for deserting. I did not believe the number of deserters would materially affect the army. On other hand, the issuing of the proclamation would probably bring into the ranks many who otherwise would not volunteer. Ronald C. White, Jr., wrote that this section of the Second Inaugural makes a clear allusion to President Lincoln’s “fidelity to the Constitution. The word ‘Constitution’ is never used in the address, but the nature and meaning of the Constitution are present throughout.” White noted that in President Lincoln’s First Inaugural, he had said: “I have no purpose, directly or indirectly, to interfere with the institution of slavery in the States where it exists. I believe I have no legal right do so, and I have no inclination to do so.”22 Nevertheless, Mr. Lincoln understood that slavery was morally indefensible. President Lincoln was especially sensitive to the loyalty of and attitudes in the Border States. These states were positioned at points along vital rivers and rail networks that the Union needed to control. “The Emancipation policy, and the arming of the black men – the two great measures of the Administration – are swiftly vindicating the wisdom of their author. In the opinion of several of our best and foremost generals – old Democrats, too – they have been the heaviest blows yet given to our enemies. Such measures, for which there could not possible be found any adequate precedent, must ever be judged by their results, and the results are presenting themselves each day for our examination. How many troublesome questions will be settled at once and forever by that same Proclamation, can only be understood by the men who had command in rebel districts before it became the law of the land, and who honestly endeavored to carry out ‘the compromises of the Constitution,’ in the management of their commands. Michael Burlingame, editor, With Lincoln in the White House: Letters, Memoranda, and Other Writings of John G. Nicolay, 1860-1865, p. 102 (January 2, 1863). Michael Burlingame, editor, With Lincoln in the White House: Letters, Memoranda, and Other Writings of John G. Nicolay, 1860-1865, p. 172 (January 31, 1865). Richard Nelson Current, The Political Thought of Abraham Lincoln, p. xix. Richard Nelson Current, The Political Thought of Abraham Lincoln, p. xvi. Ronald C. White, Jr., Lincoln’s Greatest Speech: The Second Inaugural, p. 95. Martin H. Greenberg and Charles G. Waugh, editor, The Price of Freedom: Slavery and the Civil War, Volume I, p. 319 (Hans L. Trefousse, “Lincoln and Race Relations”). Don E. and Virginia E. Fehrenbacher, editor, Recollected Words of Abraham Lincoln, p. 295 (from Charles Edwards Lester, Life and public Services of Charles Sumner, pp. 359-360). Theodore Calvin Pease, editor, Orville Hickman Browning, Diary of Orville Hickman Browning, Volume I, p. 555 (July 1, 1862). Don E. and Virginia E. Fehrenbacher, editor, Recollected Words of Abraham Lincoln, p. 434 (Letter from Charles Sumner to John Bright, August 5, 1862). Don E. and Virginia E. Fehrenbacher, editor, Recollected Words of Abraham Lincoln, p. 435 (Letter from Charles Sumner to the Duchess of Argyll, August 11, 1862). Don E. and Virginia E. Fehrenbacher, editor, Recollected Words of Abraham Lincoln, p. 360 (Conversation with Edwards Pierrepont and James S. Wadsworth). Don E. and Virginia E. Fehrenbacher, editor, Recollected Words of Abraham Lincoln, p. 387. Francis B. Carpenter, Six Months at the White House, p. 75. Don E. and Virginia E. Fehrenbacher, editor, Recollected Words of Abraham Lincoln, p. 394. Don E. and Virginia E. Fehrenbacher, editor, Recollected Words of Abraham Lincoln, p. 354. Don E. and Virginia E. Fehrenbacher, editor, Recollected Words of Abraham Lincoln, p. 417. Don E. and Virginia E. Fehrenbacher, editor, Recollected Words of Abraham Lincoln, p. 314. Don E. and Virginia E. Fehrenbacher, editor, Recollected Words of Abraham Lincoln, p. 455. Don E. and Virginia E. Fehrenbacher, editor, Recollected Words of Abraham Lincoln, p. 470. Don E. and Virginia E. Fehrenbacher, editor, Recollected Words of Abraham Lincoln, p. 367-368 (Sermon preached in April 16, 1865). Roy P. Basler, editor, The Collected Works of Abraham Lincoln, Volume VIII, p. 332-333 (March 4, 1865). Ronald C. White, Jr., Lincoln’s Greatest Speech: The Second Inaugural, p. 94-95. Don E. and Virginia E. Fehrenbacher, editor, Recollected Words of Abraham Lincoln, p. 116 (Sacramento Union, December 14, 1864). Don E. and Virginia E. Fehrenbacher, editor, Recollected Words of Abraham Lincoln, p. 118 (New York Tribune, August 30, 1885). Don E. Fehrenbacher, editor, Dwight Lowell Dumond, The Leadership of Abraham Lincoln, p. 183 (K.C. Wheare, Lincoln’s Devotion to the Union, Intense and Supreme). Gabor S. Boritt, editor, Lincoln the War President, p. 140 (Kenneth M. Stamp, “The United States and National Self-determination”). William H. Herndon and Jesse W. Weik, Herndon’s Life of Abraham Lincoln, p. 442. Allen Thorndike Rice, editor, Reminiscences of Abraham Lincoln, p. 87-88 (John P. Usher). Gabor S. Boritt, Lincoln and the Economics of the American Dream, p. 257. Jennifer Fleischner, Mrs. Lincoln and Mrs. Keckly: The Remarkable Story of the Friendship between a First Lady and Former Slave, p. 263. Alexander K. McClure, Lincoln and Men of War-Times, p. 107. James M. McPherson, Marching Toward Freedom, p. 15-16. Michael Burlingame, editor, Dispatches from Lincoln’s White House: The Anonymous Civil War Journalism of Presidential Secretary William O. Stoddard, p. 107 (New York Examiner, October 3, 1862). Michael Burlingame, editor, Dispatches from Lincoln’s White House: The Anonymous Civil War Journalism of Presidential Secretary William O. Stoddard, p. 112-113 (New York Examiner, October 9, 1862). Harry V. Jaffa, Crisis in the House Divided, p. 402. Martin H. Greenberg and Charles G. Waugh, editor, The Price of Freedom: Slavery and the Civil War, Volume I, p. 319-320 (Hans L. Trefousse, “Lincoln and Race Relations”). Gabor S. Boritt, editor, Lincoln the War President, p. 54-55 (James M. McPherson, “Lincoln and the Strategy of Unconditional Surrender”). Michael Burlingame, editor, Dispatches from Lincoln’s White House: The Anonymous Civil War Journalism of Presidential Secretary William O. Stoddard, p. 167-168 (August 31, 1863). Roy P. Basler, editor, The Collected Works of Abraham Lincoln, Volume VII, p. 506-507 (August 19, 1864). 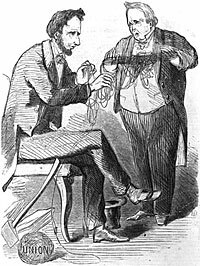 Douglas L. Wilson and Rodney O. Davis, editor, Herndon’s Informants: Letters, Interviews and Statements about Abraham Lincoln, p. 562 (Letter from Henry Wilson to William H. Herndon, May 30, 1867). William H. Herndon and Jesse W. Weik, Herndon’s Life of Abraham Lincoln, p. 443 (Quote is from Henry J. Raymond, Life and Public Services of Abraham Lincoln, p.764). Frederick Douglass, Life and Times of Frederick Douglass, p. 485 (Speech at the Freedmen’s Monument, April 16, 1876).